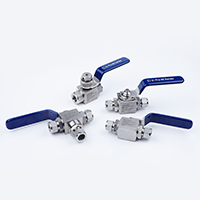 The DK-LOK® V86 Series Ball valves have high pressure capability up to 10,000 psi (689 bar) featuring a blowout proof design with internally loaded stem. A variety of end connection types including compression, male and female NPT, male and female BSPT, female BSPP, and female SAE allow for wide system requirement connectivity. Configurations include two way isolation and three way diverter having the option of side entry as well as conventional bottom entry to accommodate system needs. The VC86 CNG/NGV version incorporates PEEK seats and HNBR O-rings with CNG/NGV certifications. The sealing material of PEEK seats and HNBR O-rings are selected for specific compatibility with CNG. Additionally, the VC86 series takes advantage of live loaded compensation disc springs that load the seat against the ball under both low and high pressure systems in CNG and NGV applications.